This course is for healthcare professionals who want to improve their STEMI recognition and assessment skills or for healthcare professionals seeking continuing education credits. 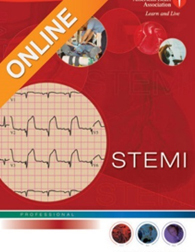 Learn – Rapid STEMI ID is a self-directed, online course that teaches healthcare professionals to use a 12-lead ECG, interpret electrocardiograms (ECGs) for signs of STEMI (ST-segment elevation myocardial infarction) and activate a system of care for rapid reperfusion of an occluded coronary artery. This course supports the efforts of the American Heart Association’s Mission: Lifeline® a national initiative to improve quality of care and outcomes in heart attack patients by improving healthcare systems’ readiness and response to STEMI patients. Contact Obsidian to purchase the course. Upon purchasing the course, an online access key with instructions on how to activate the online access key will be sent to you. Continuing Education Hours: This continuing education activity is approved by the American Heart Association, an organization accredited by the Commission on Accreditation for Pre-Hospital Continuing Education (CAPCE), for 4.50 Advanced Continuing Education Hours (CEHs) for the initial online course, (activity number 15-AMHA-F3-0251). A renewal online course option is not available at this time. For professions other than EMS, Continuing Education may still be available. Visit the American Heart Association online or call Obsidian for more information. A certificate of completion is provided upon successful completion of this course; this course does not offer an AHA course completion card. Textbook comes with the ECG ACS Ruler, which is created to aid with reading, analysis, and recognition of electrocardiograms.